September 2017 Incredible place to stay, the apartment was amazing and the view could not have been beaten! Really helpful hosts always on offer for any advice, assistance and help they honestly could not have done more. We all had a fantastic holiday and would definitely go back. Gemma, UK " Gemma Pritchard "
Our trip to Italy was amazing. Our stay in Lake Como exceeded all expectations. The VRBO experience was the best ever. This place was a five star experience! All of the help and information could not be better. We have already recommended La Dolce Vita to friends and family. My son and his wife who live in Italy plan to rent it in the fall. Thank you for how easy you made this process and the wine and croissants that greeted us upon our arrival really put us over the top! My soul is forever changed after spending time at this location on the veranda. Thank you. " Mike & Monica "
Just wanted to drop you a note and say what a lovely time we had once again in Varenna. 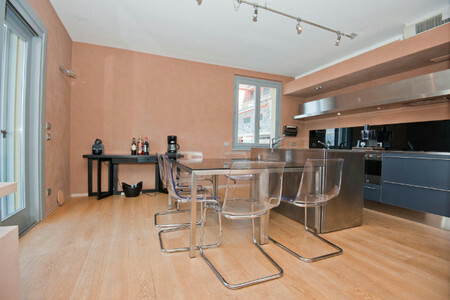 The Dolce Vita apartment was excellent and we hope to visit again at the same time next year. " 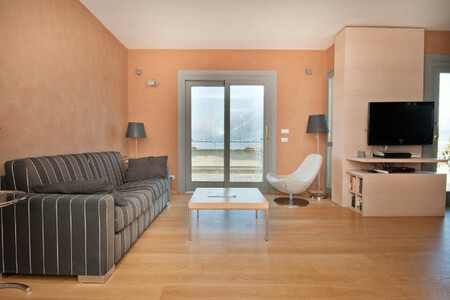 Lesley "
We had a great holiday and were thoroughly pleased with la Dolce Vita; it is a great property. As for restaurants, we particularly liked Hosteria del Plantano, right down the road, Osteria Quattro Pass in Varenna, and Silvio in Bellagio. Favorite activities were hiking the paths around Varenna, particularly to the source of the Fiumelatte, going to the beach at Lierna, and the Moto Guzzi museum (I’m biased, as I have a Moto Guzzi). " David "
Hello, I had sent a note to George when we first returned about the apartment...maybe he has not shared that with you. We LOVED the apartment, it was perfect for our restful get away. It was furnished nicely and I was amazed at all the dishes and pans. Most rentals have just the bare necessities but this was wonderful. The location was great...we did have a car but only used it twice during the week. We walked to Varenna to get the ferry and enjoyed walking along the gardens. Each time we passed Fiumelatte, we would stop and feel the cool air rushing from the raging water. We went to Bellagio twice, we really loved that town. And we went to Menaggio as well. 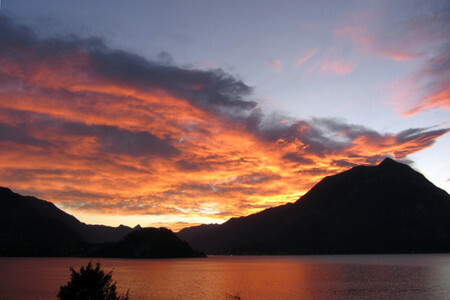 We also drove to Lugano one day and then also took the train to Milan one day. Mostly we stayed around the lake and had lunch out every day then returned to the apartment where we would cook some delightful Italian food and watch the sun set over the lake...pure heaven! We were celebrating our 30th wedding anniversary so it was wonderful to be where it was quiet and relaxing. The directions to the apartment were terrific, we had no challenges finding it or getting the keys and navigating the parking garage. We did have an issue with the key to the apartment(the first door) we could not get the key to turn in the lock and we had to wiggle it for 20 minutes. I did send a note to George about this and he was having someone look at it. Everyone we dealt with at Happy Holiday Homes was terrific and we would definitely use your rental services again. The people who rented the apartment before us left garbage under the sink in the kitchen and I hope that they were informed that they should have removed all the trash...it started to smell...yuk! I don't think there were any other renters in the building while we were there so it was very quiet. I did write a review on Trip Advisor as well about our experience on Lake Como. Thank you for making our vacation a very memorable one. We have been to other parts of Italy, but this was by far the most beautiful...we will certainly be back! " Rylee "
We liked La Dolce Vita very much. The view from the veranda was as advertised - fabulous. Other than the issues listed below, we found our stay very nice. 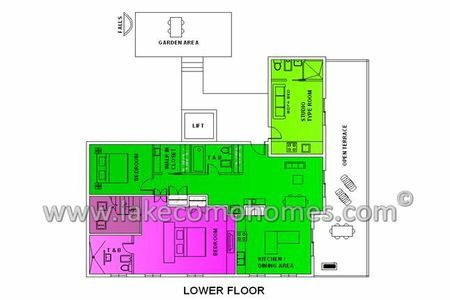 The information provided within the condo was helpful and facilities were good. Interesting that only two devices could connect thru the WIFI simultaneously, but that wasn't an issue. The garage was a plus. " Joseph Gardner "
We had a fabulous time in La Dolce Vita and on the shores of Lake Como. Varenna and Bellagio were more beautiful thaN we could have imagined, and staying in the quiet of Fiumelatte was also very special. The views over the lake from the balcony are to die for! We would also recommend the wonderful restaurant there (Crotto del pino), both for its food and the incredible views. Future visitors might like to be aware that some of the trains from/to Lecco stop at Fiumelatte, and one can walk down the short (if steep and slightly over-grown) path straight down into the village. Thank you very much for all your helpful information and assistance. " Mary "
My family and I enjoyed a fabulous week on Lake Como on our travels to Florence. 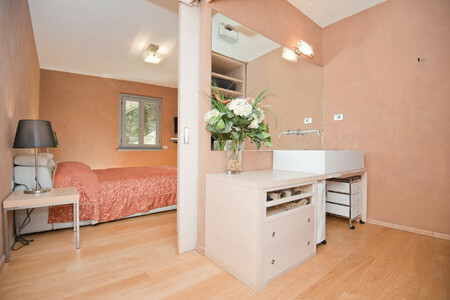 Our apartment, La Dolce Vita was so beautiful. There was a sunny lake view terrace perfect for sunbathing and of course for alfresco dining! The decor inside was really luxurious and we could see ALOT of thought had gone into making it so stylish and comfortable, all at the same time! 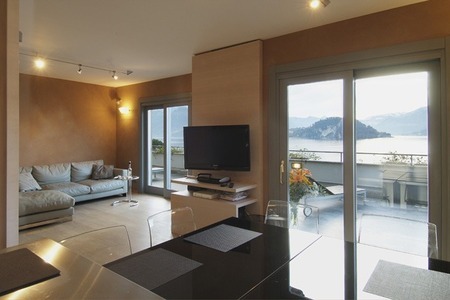 The apartment was in a really interesting setting and we so closeby Varenna. What a pretty place! The cobbled streets, lake view vistas and cute little cafes and restaurants..such an idyllic place! We really enjoyed visiting the famous villas on Lake Como and it was so great to be within easy reach of the ferry port in Varenna so we could easily reach all the principal ones. Bellagio was equally romantic and my wife and daughter really fell in love with the place. Does it have anything to do with the shops I wonder?! The resort town had a really nice Lido too so it was a great place to spend the day. The golf club uo in the Menaggio hills was excellent and we found a great little organic restaurant called la Barcola.. which was located just after the golf club, off the main road towards Porlezza. I would recommend having a hire car here so you can easily get around and see everything you want to see. Lake Como had so many amazing restaurants and had such an awesome sense of beauty and history all intertwined in one. A truly magical place! " Frederick Connolly "
We appreciate your interest in our vacation and many suggestions. When we go to Menaggio we will surely stop in to say,"Hello". Fortunately, we have a private tour of all the places in Milan you mentioned including The Last Supper. We have also researched the gardens and villas and expect to spend a lot of time at the outstanding ones. Gardens & architecture are wonderful places to visit and we have enjoyed them during our travels here and abroad. I have a passion for food and have looked forward to dining in your area. Fortunately we walk a lot which helps when eating in Italy. Since La Dolce Vita is on the outskirts of Varenna we expect to be working off our meals with some frequency. We are leaving golf behind and focusing only on the lake, beauty, food and people when we go this time. I have heard all about the Outlet and may not be able to resist the temptation especially if we have a rainy day. Thanks again and picture me with a glass of wine on the terrace at La Dolce Vita fulfilling a dream. " Rosemary "
La Dolce Vita spoiled us for the rest of our holiday and set a very high standard indeed. 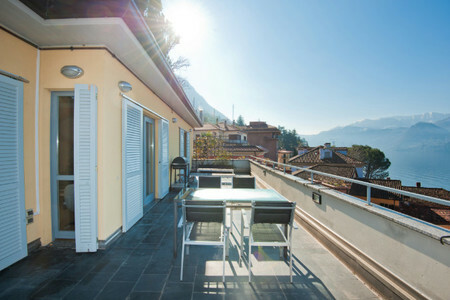 The private terrace and views of the lake, Varenna, Menaggio & Bellagio were just amazing. The apartment was extremely comfortable & functional - a perfect home away from home. We had a car, for which I was grateful & having secure parking was a godsend. The staff at Happy Holiday Homes provided excellent information on the villa as well as great suggestions on places to visit. Overall our 8 night stay at La Dolce Vita was the highlight of our 4 week holiday in Italy & I would recommend it unreservedly! Thank you!!!! " Lisa "
Laundry: We’ve been travelling in France and Italy for ~2 months now, and this is the first apt with “Laundry Facilities” that has both a washer AND DRYER. This was a most pleasant surprise, and we think you should tout this in the web ads. TV: This is also the first place with more than BBC in English. The service and screen here are modern enough to be able to menu-switch most movies and shows to English. 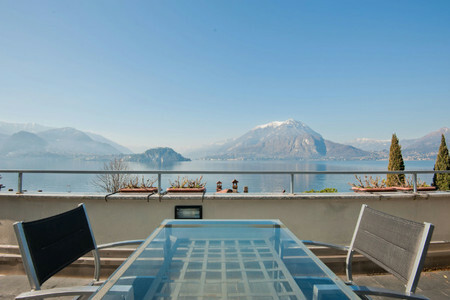 Bummer, as who want to sit around (finally) watching TV on good weather days on lake Como? Kitchen: Cooking with the stuff in most holiday apartments is just a bit above camping. Doable, but just barely. Here the kitchen is equipped so well that Laura is planning to buy some Le Creuset pans when we get back. Same with the pasta cooker, food processor, etc. Style: This place is so cool that companies should give stuff to showcase, as with the kitchen. We also love the hamper, the living room lamps, the drawers in the kitchen and the dressing room, the chairs, etc. etc. etc. La Dolce Vita.. is aptly named! " 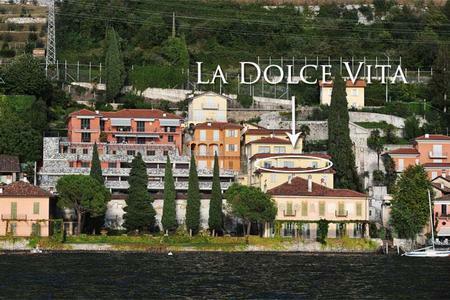 Dean VanDruff "
We loved our stay at La Dolce Vita,the apartment was great with a perfect view of the lake,all the amenities were excellent,modern and convenient. Our trips to Bellagio,Menaggio and drive over to Lugano and eventually to Foxtown for some serious shopping for the ladies all were wonderful;i would recommend renting a car in Lecco on the way down,we did this the next day when we realised the inconvenience and distance of getting to and from the ferry each day in Varenna, We did rent the boat for about 4 hrs on the lake which was a lot of fun;also a cooking class that Danilo recommended was a wonderful choice. " 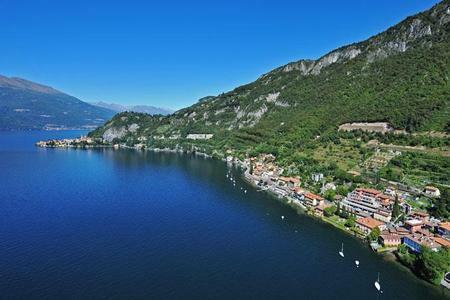 RANJIT CHACKO "
We loved our stay at La Dolce Vita, the apartment was great with a perfect view of the lake, all the amenities were excellent, modern and convenient. Our trips to Bellagio, Menaggio and drive over to Lugano and eventually to Foxtown for some serious shopping for the ladies all were wonderful; I would recommend renting a car in Lecco on the way down, we did this the next day when we realised the inconvenience and distance of getting to and from the ferry each day in Varenna. We did rent the boat for about 4 hrs on th lake which was a lot of fun; also a cooking class that Danilo recommended was a wonderful choice. " Ranjit "
Laundry: We've been travelling in France and Italy for ~ 2 months now, and this is the first apartment with 'Laundry Facilities' that has both a washer and a DRYER! This was a most pleasant surprise, and we think you should tout this in the web ads. TV: This is also the first place with more than BBC in English. The service and screen here are modern enough to be able to menu-switch most movies and shows to English. Bummer, as who want to sit around (finally) watching TV on good weather days on Lake Como? Kitchen: Cooking with the stuff in most holiday apartments is just a bit above camping. Double, but just barely. Here the kitchen is equipped so well that Laura is planning to buy some Le Creuset pans when we get back. Same with the pasta cooker, food processor, etc. 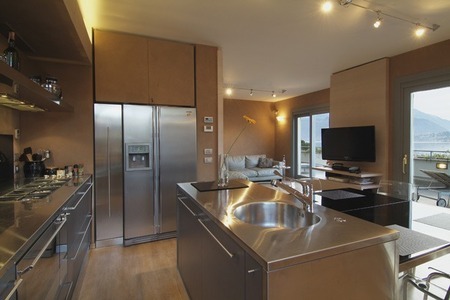 Style: This place is so cool that companies should give stuff to showcase, as with the kitchen. We also love the hamper, the living room lamps, the drawers in the kitchen and the dressing room, the chairs, etc. etc. etc. La Dolce Vita.. is aptly named! " Dean "
Upscale and ultramodern apartment with all the amenities. The view of Lake Como was worth the price paid. Service from the management company was prompt and courteous. There was a little bakery/store as well as a great restaurant less than a 5 min. walk away. We took a taxi into town a few times, but mostly we walked approximately one mile into Varenna and back. It was an easy lakeside walk past beautiful gardens as well as the famous Fuimelatte--the shortest river in Italy. From Varenna we explored the Lake by ferry. We visited Bellagio, Villa Carlotta and it's gardens etc. The second "bedroom" is completely separate from the rest of the apartment, although it does connect via the terrace. 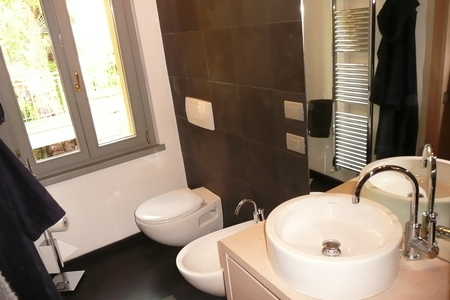 We had a few minor issues with the main bathroom - ultramodern does not always mean practical... " Anonymous "
We have enjoyed our holiday very much at Lake Como. La dolce vita is an excellent property in a fantastic spot and we would stay there again if ever we were in the same area. It\'s very modern and spacious. It is very comfortable and we loved the views. It was nifty to be ale to get to fiumelatte train station so quickly. The kitchen was excellent as we love to cook. It would have been nice to have a few basic things in the kitchen like salt, pepper, oil etc but we understand your policy on food - although this should have been specified on booking as an information as most apartments we have stayed so far have these basic provisions as a routine - it helps planning for the trip especially as there is no close supermarket to la dolce. However, The little shop just past fiumelatte station was very nice and Sonia was lovely and helpful despite our language differences. 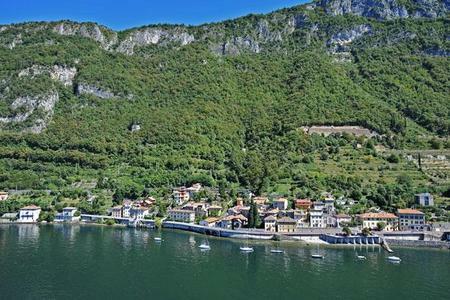 Your directions to find apartment were excellent but Also it would have been useful to be informed as to the distance from varenna and advice and possibility to prebook a taxi on arrival if travellers had no car. We had a fantastic and relaxing stay in the apartment which we thought was excellent. " Domenika Turkiewicz "
My husband and I loved our time spent in Varenna at the lovely La Dolce Vita. 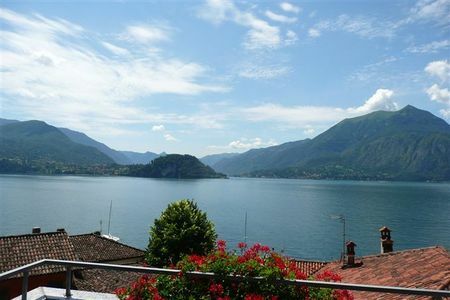 The apt.is very elegant and the location, right on Lake Como, is perfect for beautiful views. We enjoyed walking into Varenna everyday and taling the ferry across the lake to other villages. We especially liked Cernobbio and Bellagio. The food was delicious everywhere we ate, especially the fresh seafood. In Varenna, we especially enjoyed the restaurants at Hotel Du Lac and Villa Cipressi for lunch on their terraces. The concierge at Villa Cipressi was particularly helpful. We do have a suggestion for improving the experience. We arrived in Varenna after a long day of travel and found there was no toilet tissue in the apt. There was no telephone to call for a taxi. We had to walk back into the village in the rain so our stay there began with inconvenience and dampened spirits. Adding insult to injury, so to speak, the market was closed in Varenna, so we had to explain our situation and "borrow" toilet tissue from the concierge at Hotel Cipressi! It was a little embarassing. It would be helpful to have the apt equipped with bare essentials like toilet tissue, more soap (only the holder in the hallway had soap), salt and pepper. etc,.or else to instruct the guests to pick these up on the way in. 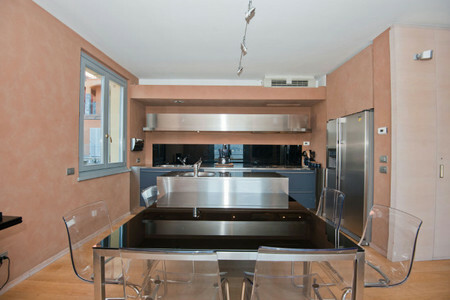 On a positive note, the kitchen in La Dolce Vita is beautifully equipped and a joy to use. It was lovely to hear the fountain from the bedroom. The sunsets and sunrises from the deck were spectacular! Also, we enjoyed the walk from Fiumelatte to Varenna, but some may find it strenuous, especially in rainy weather, so may want to arrange for a car or taxi service. This info would be helpful in advance. Thank you for your attention and interest. Best regards to all, Paula, USA " Paula Foster "
My husband and I had the pleasure of staying at this lovely condominium for 5 nights and thoroughly enjoyed it. The contemporary, recently renovated flat met all of our expectations, and then some – from the chic design styling, to cleanliness, to responsive customer service when we had a question. The view from the living room, kitchen and enormous terrace (balcony) was stunning, framing a picture postcard scene every day. Having access to an additional studio contiguous to our flat, with separate full bathroom, was an added plus which we very much appreciated, and which also shared this wonderful view and spacious balcony. If there were downsides, these were not inside the unit itself, but centered on the many locks and keys which are requirements for safety and security, we assume. Specifically, there were no less than 4 keys needed for entering or leaving the flat which could be daunting, especially when on holiday with more of a holiday mindset. Having an indoor parking space was great, but this involved 2 different remote control buttons – one for opening and closing the external gate into the parking garage, and the second one for opening and closing our personal garage space. All in all everything worked out very well, but this was a bit of an inconvenience which we did not look forward to every day, much less twice a day. Perhaps we are spoiled in this regard, as we live in a safe and secure environment in the Carolinas. Overall, we strongly recommend this beautiful property and the rental management company that provided everything they said they would, and more. On a 1-10 scale, I give this property a 9.5. Had the key and garage situation been easy and smooth, I would be able to give this unit a full 10 out of 10. Thank you, Lillian, Ph.D. " South Carolina "